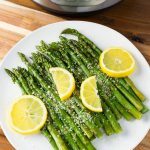 Instant Pot Asparagus is fresh tasting, and the lemon butter sauce is delicious over it. This is a perfect vegetable side dish for your Holiday meal, or with salmon. 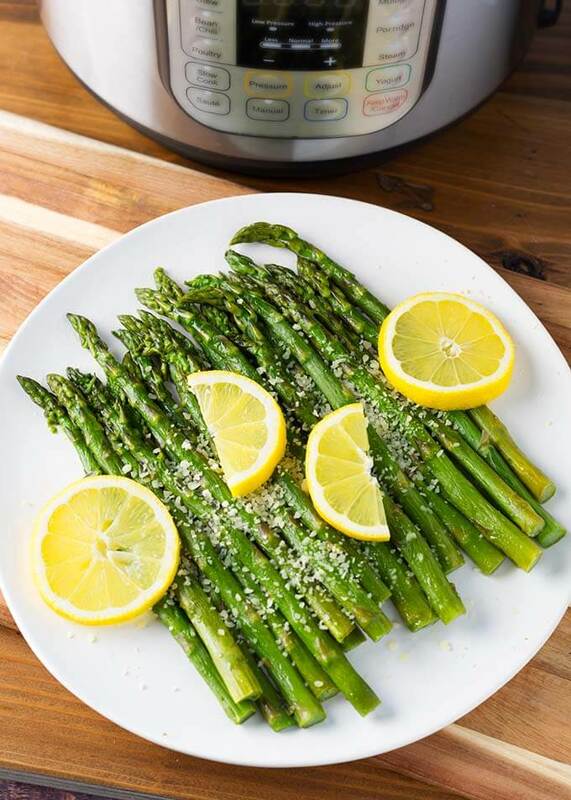 Pressure cooker asparagus is super fast to make! I really enjoy steamed vegetables. Asparagus is one of my favorites! I also love it roasted, in soup, and in risotto! Today I’ll show you how I cook asparagus in the Instant Pot®. When those fresh green stalks of asparagus start appearing in the grocery store in early Spring, I always buy some. Our Easter dinner is not complete without Asparagus on the table next to my Easter ham! It’s really easy and fast to cook asparagus in the pressure cooker. The biggest concern will be overcooking it. The cook time will depend on how thick they are. You can cook more than the recipe calls for at one time. The cook time will remain the same. What size asparagus should you get? I have seen pencil thin asparagus, all the way to the size of a medium carrot! I try to get them in between, about the size of my thumb, which are not small for a girl. 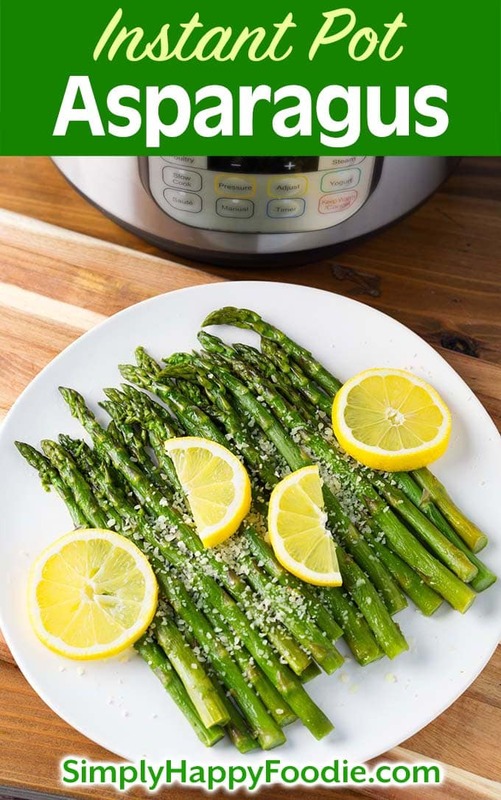 See the recipe card for the cook times, and for my lemony garlic sauce that I like to serve over this pressure cooker Asparagus. Enjoy all different varieties of fresh, healthy vegetables steamed in your pressure cooker. Experiment with different flavors for your sauce, or enjoy them with simple salt and pepper! You could also try cooking more that one type of vegetable at a time, if they have similar cook times. A steamer basket helps with this. 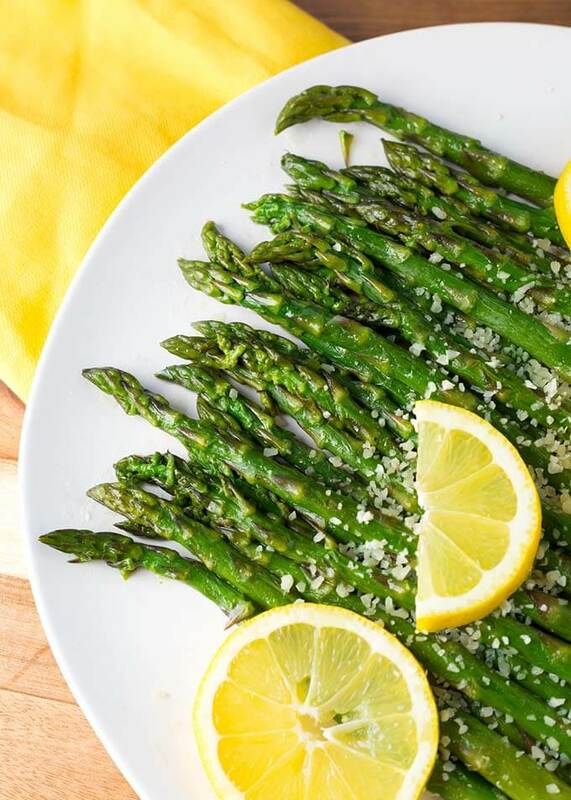 Instant Pot Asparagus is fresh tasting, and the lemon butter sauce is delicious over it. This is a perfect vegetable side dish for your Holiday meal, or with salmon. Make sure your asparagus fit in the pot. Trim the ends to make them fit. Add the water and butter to the pot. Also add garlic, if using. Press the Pressure Cook/Manual button or dial. Then press the +/- button or dial to select 1 minute. Select 0 minutes for thinner asparagus*, or for crisper results (see note). When the butter is melted and the water is hot, add the asparagus, laying half in the pot, and the other half crossways over the first layer. You don't need a steamer rack, it is optional. Close the lid and set the steam release knob to the Sealing position. The pot will take a few minutes to come to pressure. As soon as the cooking cycle is finished, turn the steam release knob to the Venting position. When the pin in the lid drops back down, open the lid. Use tongs to gently take the asparagus out of the pot onto a plate. Add the salt and lemon juice to the liquid in the pot. Taste and adjust salt and/or lemon juice as needed. Stir in the parmesan and then spoon mixture over the asparagus. *If your asparagus is really thin, or you like it a little crisper, try using LOW pressure to avoid overcooking it. I tried this today and it came out perfect! I used the 0 minutes and it was just the way I like it! I will keep this recipe. That’s wonderful! I’m so happy this worked for you, Linda! Is the asparagus criss-crossed on a steamer rack or on the bottom in the liquid? On the bottom of the pot, however you can use the trivet if you want to.